The mountain season started in the Cordillera Blanca. 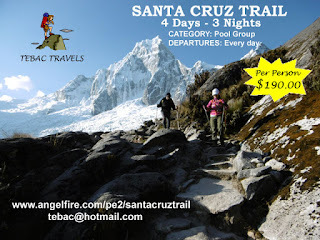 The Santa Cruz Trail is the most known trek in that region, located in the National Park Huascaran. It's a 4 day-3 Nights program, that start in Huaraz the capital of Ancash. On the trail you get to see these snow-capped mountains, such as the Huascaran(6,768 mts. ), Huandoy (6,395 mts. ), Chopicalqui (6,354 mts. ), Taulliraju (5,830 mts. ), Artesonraju (6,025 mts. ), and Alpamayo (5,947 mts.). There are two high panoramic viewpoints, Portachuelo de Llanganuco (4,750 mts) and the Punta Unión Pass (4,750). There are small villages on the road, Colcabamba, Huaripampa and Cashapampa and lakes which are located in these valleys making the scenery spectacular. If you like to make your reservation be welcome to do it at our office in Lima. Markawasi, the most imposing of the Sacred Mountains on Earth. Dr. Daniel Ruzo, dedicated many years to study Markawasi, to prove that this place was not a separated plateau, submitted to an impossible erosion; but the most important of all the Sacred Mountains of the Earth: accrediting a cultural reality and its symbols. Strong and mighty people, beginners of a complete culture, made 85 centuries ago, a dam from the waters of the rains, to irrigate the land that surrounded them, during the six months of the dry season. Converted this plateau of Markawasi into a firm fortress and a religious center with four huge altars and decorated the 3 square Kms. with marvelous sculptures, that no one can deny. It's located close by Lima, 4 hours away in the foothills of the Andes. We offer a 3 Days 2 Nights programs. If you are interested , you can see more details at Markawasi Programs. WELCOME TO OUR BLOG, WE ARE BACK AGAIN!! Hope you enjoy it and helps your travels.